Includes biosafety certifications of laboratory users, biohazard permit, lab coats, nitrile gloves, goggles, shelving, fixed tissue culture/ biotextile specimens, laboratory fridge with culture media and falcon tubes of wet biomaterials, as well as Incubatrix Neith and incubator log sheets filled daily by gallery staff. The Ossificatorium highlights the overzealous institutional risk assessment that occurs when biomaterials are used onsite in a gallery. This risk assessment, meant to mitigate biohazards from occurring in the workplace, is arguably more based on strict insurance carrier requirements than an actual probability of risk. However, it may also reflect social norms with regards to risk perception, and social (moral) codes about the body. The Ossificatorium is an official biosafety space within the gallery but separate from it, where public fear of contagion (though none of the materials used are contagious) is assuaged by the presence of PPE (personal protective equipment that provides bodily barriers), an impression of sterility and containment, as well as full institutional regulation/ approval. The performed role of gallery staff in regularly monitoring and maintaining the functioning of Incubatrix Neith is a disruption in the artist/gallery relationship. 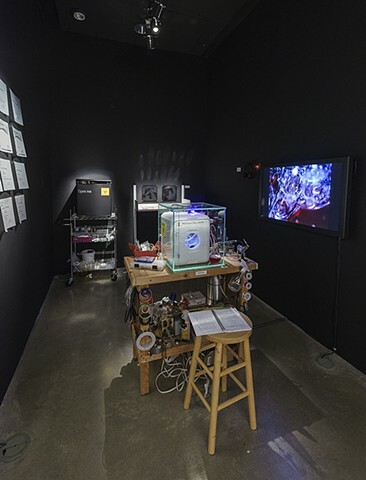 Gallery staff are heavily implicated in the labour of care (which is part of the artwork) and survival of the vital material inside the incubator.